The Tropical Punch Blog Hop! Today we have the pleasure of sharing the work of many wonderful bloggers who were sent a Tropical Punch bag of goodies. There were no rules for this hop. Tropical punch kits were sent to jewelers, paper artists and sewers. These designers were encouraged to create anything they would personally love. The results are fabulous! To read more about each project you can click on the link provided or the picture of the finished piece. Join us by visiting each participant! Tropical Punch post by Cindy is linked here. 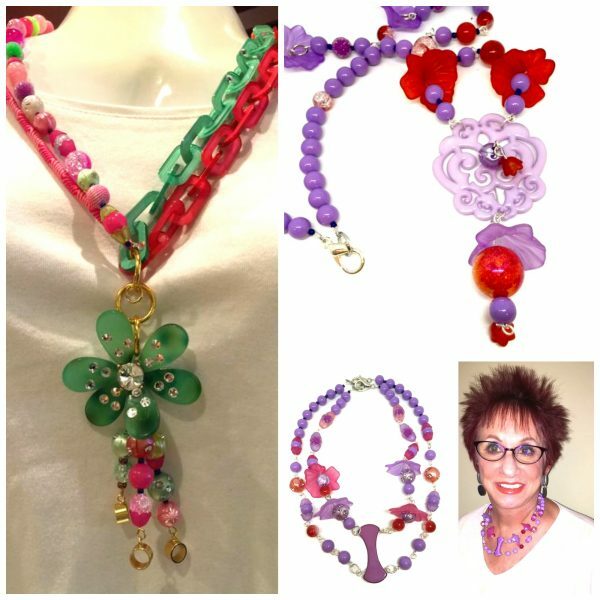 Part of Cindy’s article is also on the BeadFX blog linked here. 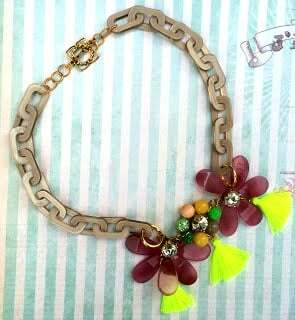 Tropical Punch by Tammy Powley. 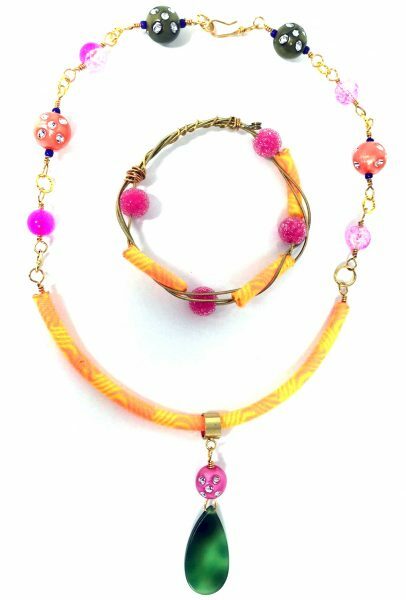 “I was really fascinated with the polyester pipe that was sent as part of the package I received, and you can see that I included it in all three pieces I made. 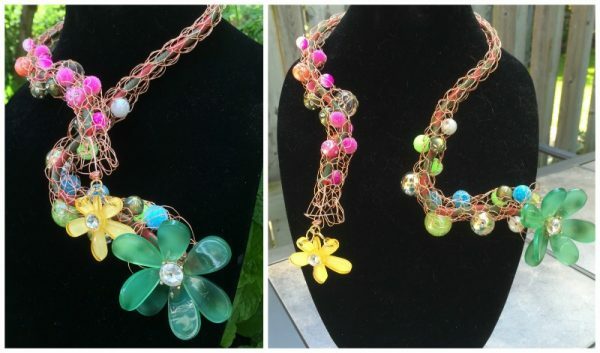 In one necklace, I used about 6 inches of it and then used beads, wire, and jump rings to add the center piece section and also the strap of the necklace.” When you pop over to Tammy’s post you’ll see a second necklace she created for the hop as well. 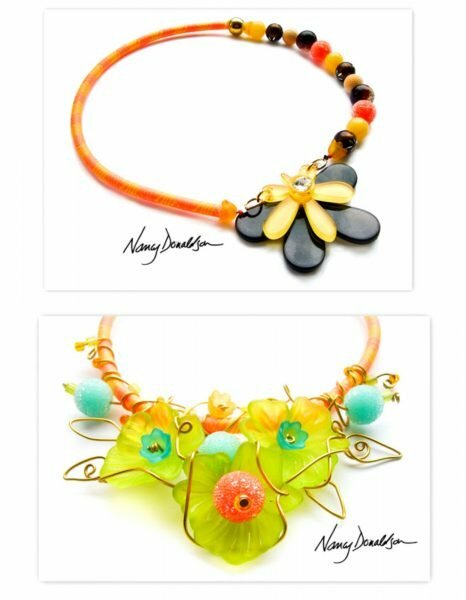 The Tropical Jewelry Design blog post by Tammy is linked here. Tropical Punch by Nancy Donaldson. 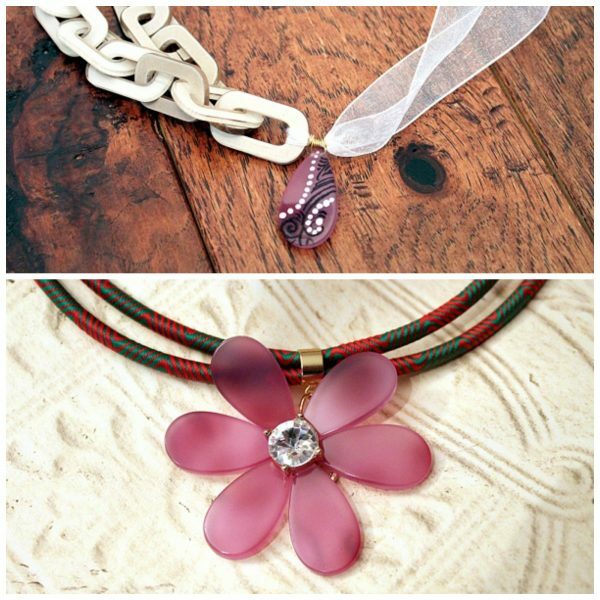 Nancy regularly contributes projects to this Dazzle-it blog. She was part of our internal team designing some Tropical Punch pieces with a Soutache twist for a UK runway show. The pieces she designed for the hop are elegant and the added wirework is inspired. 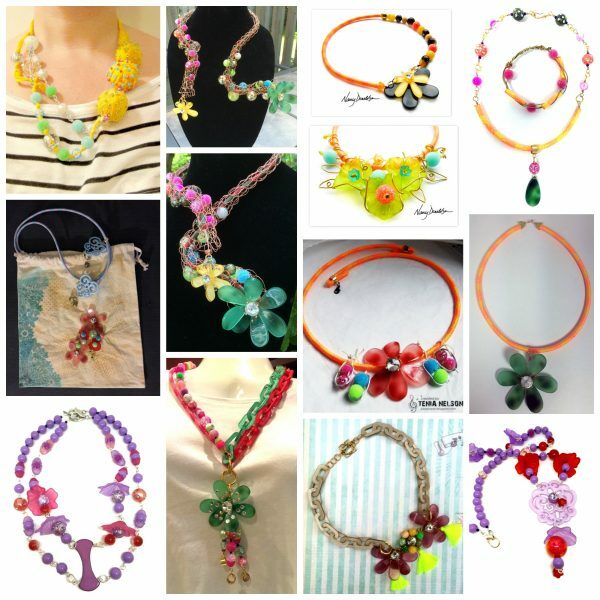 You can see many of her projects for Dazzle-it in this link. Nancy’s blog hop post is linked here. The “Loving Lucite” post by Suze Weinberg is linked here. 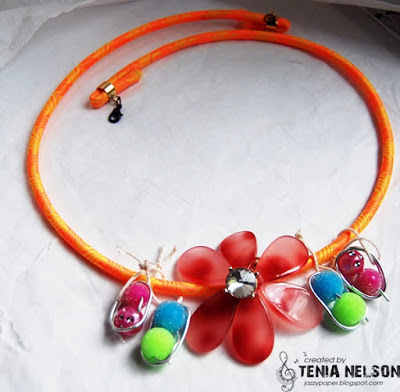 Tropical Punch by Tenia Nelson. Tenia is a well established paper arts crafter. She is very new to jewelry and I wanted her in the hop because I just knew these products would be fun and easy to work with. This necklace does not look like it was designed by a new jewelry maker at all! Well done Tenia! The link to Tenia’s blog is here. Tropical Punch by Lisa Kettell. Lisa wrote this about the blog hop kit we sent her “My package was filled with so much summer goodness. 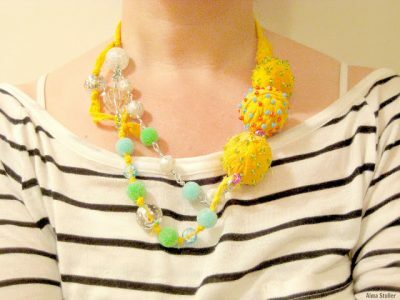 With the BoHo trend still rising this summer, I decided to create a fun summer BoHo statement necklace. The only thing extra I added were the fun tassels I made using neon floss.” Lisa provided instructions on her post so you can make one too. The link to Lisa’s blog post is here. The link to Alma’s post is here. Tropical Punch by Laura Weed. Laura may receive the over-achiever award for her project for our blog hop! 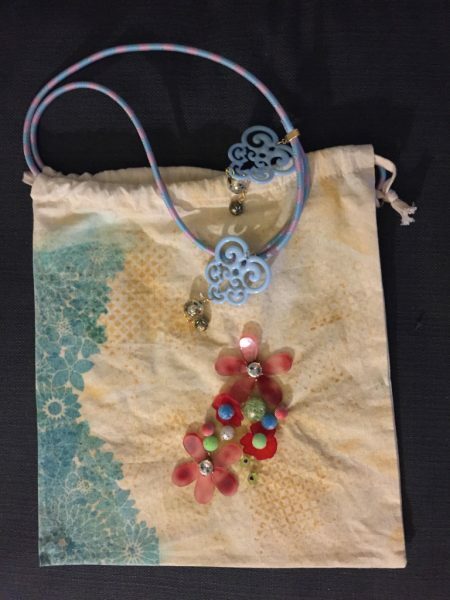 Proving that you do not need to be a jeweler to love these components, she turned the muslin bag we used to ship her products, into a new carryall! The link to Laura’s post for Stampendous is linked here. Wendy’s blog post is linked here. Author Carmi CimicataPosted on June 24, 2015 March 23, 2017 Categories Dazzle-it Blog Hop, Tropical Punch!Tags Blog Hops, Tropical Punch!